Tell us about being triVios! 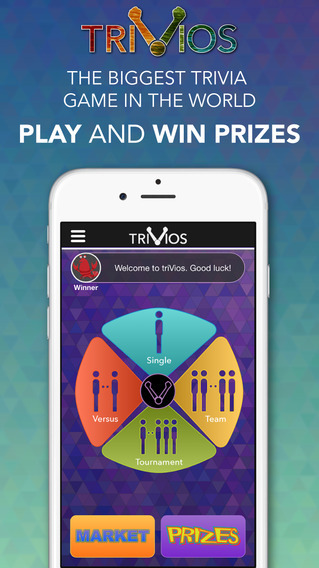 triVios can be summed up very simply; It’s a real-time trivia game that allows players to win awesome prizes by playing one of four unique trivia game modes. Players can also engage socially via their profile, live and offline messaging, and competing with or against each other! Rather than giving out worthless XP points for playing a game, we are providing our players with a fun and engaging challenge that rewards them for their skill and participation. How is your app different from similar apps? 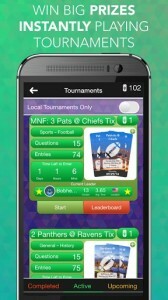 triVios is a real-time trivia game that allows players to compete for great prizes. There are four different game modes you can play. Our personal favorite is Tournament mode where you can enter as many times as you want and compete for set prizes. We even have local tournaments so you can battle friends in your area. Last week, our players competed in tournaments and won a Vizio flat-screen LED TV, Michael Kors watch, Bose Bluetooth SoundDock, tickets to NFL games, and tons of gift cards! Our current featured tournament prize is an Xbox One. You can also play Single player on your own and rack up Gator Bucks incognito style, or play against other triVios players and win Gator Bucks with each victory. Then there’s Team Battle, where you can team up with a friend and compete against another two-player team (in real-time of course) and win Gator Bucks. Rather than winning worthless XP points like every other game, players redeem their Gator Bucks in our Prize Store for prizes like headphones, TV’s, jewelry, and Amazon, Lululemon, and Nordstrom gift cards just to name a few. triVios truly is a unique app. When you take a look at our competitors – other games as a whole, and specifically trivia games – no other game or app rewards their players with real prizes simply for playing. Everybody can truly win in triVios! QuizUp and Trivia Crack, which are widely regarded as the biggest trivia games in the world, only have one game mode – Versus mode – while we give our players the option to play individually, play against others, team up with others, and play against many people at once in tournaments. Our trivia question database contains over 3 million questions ranging from history to sports to education. No other trivia game in the world has even close to this many questions. Players can test their math skills or play word games in English, Spanish, French, German, Italian, and Portuguese. Another great and unique feature of triVios is our local/regionalized games. We offer tournaments that are only available to certain areas to offer local prizes and provide an exciting social aspect for players to compete against others from their same area. Although triVios is free, we still do not have any advertisements in the game because we want our users to have the best experience possible when playing. Rather than having to worry about being spammed with annoying ads, triVios players can simply enjoy playing trivia while winning great prizes. Lastly, triVios is a true real-time game. If you’re matched with another user, the game is taking place at that exact moment for both users. QuizUp is in real-time for some of its games, however, not all games are actually played in real-time. What went into the design and UI? When creating the triVios user interface, we started off with competitor research in the space to learn what others were doing well and not so well. We then broke our app down into a wireframe and established the focus of what we believed was most important. By offering four game modes, it's one of the features that makes us more unique, as most games have only one mode. For this reason, our home screen emphasizes these various types of game play in a colorful, simple, and easy to understand layout. Of course, being the first and, as far as we know, only app to offer the ability to win prizes, we wanted to highlight that. Our prize store is modeled after some of the most successful mobile shopping apps, providing the user with only information that is most relevant for a streamlined user experience. Removing unnecessary product information allows for a minimalist appearance while providing an engaging experience so the user can focus on what is most important, winning the prize! Our app icon attempts to encompass these two main ideas as simply as possible, play our game and claim your victory with a prize. 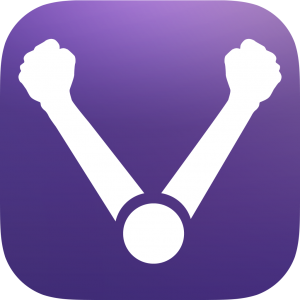 The arms in our icon depict a player who just won their game, and is expressing a joyous victory pose with his arms in the air, just like when Rocky makes it to the top of those famous steps. Last, our icon’s purple aesthetic is inherited from the apps background design and our company’s sacred royal color, Purple. The tools used in the creation of triVios include: Adobe Illustrator, Adobe Photoshop, Adobe InDesign, Adobe After Effects, Final Cut Pro X, and Rhinoceros. What tools did you use in building the app? The main tool that helped us develop triVios was StackOverflow. It’s a great resource and community to turn to when stuck on a problem or looking for a good way to approach something you haven’t done before. Other than that, we really relied on ourselves to work through the challenging issues. There’s something to be said for grinding it out and figuring out what needs to be done without giving up right away and looking elsewhere for a solution. We also attempted to use some third party plugins and frameworks but that was fairly short lived. What lessons did you learn during this process? We especially learned that relying on third parties is not a good idea in the long run. While it may seem like a good solution early on, it usually ends up coming back to bite you. It’s important to work the issues you face on your own, even if that means it’ll take a little big longer to get done. In the end, it’s worth putting the extra time and effort to build your own tools. While this isn’t always the case, it certainly was for us. What went right and wrong with the release? Early on in the development cycle, we were struggling to come up with a solution for architecting a massively scalable, real-time backend. We brought in someone to help us solve the issue and ended up building a system only to find out it didn’t work at all. This was a great learning experience for us because realized that we needed to test better before moving forward with a plan. It also was the best thing that ever happened to us, because we ended up figuring out a way to architect our own proprietary system that works beautifully rather than rely on a third party. With our release, thing went smoothly and we didn’t have any major issues on launch, which we can attribute to a two month beta testing phase that helped us work out all issues – at least for the time being). Who is on the team and what are your roles? Andrew Nadhir: CEO & Founder, James Bell: CTO & Co-Founder, Yiyang Yang: Lead Developer & Co-Founder, Sam Zoll: UI/UX Designer, Josh Xu: Intern this past summer and now part-time intern while in school, Henry Spindell: Intern this past summer. My role has me bouncing around a lot of different areas. In many regards, I am a ‘project manager’ working with everyone on what needs to be done and how we should approach it. I also carry the responsibilities of Purple Gator’s finances, accounting, marketing, networking, customer support, and many other odds and ends. James and Yiyang worked together early on to build our backend from scratch. After they solved the complexities of creating a secure, massively scalable, real-time backend, Yiyang took over building the front end while James remained working on the backend. Sam came on board right as we were beginning to start working on the front end. He worked with Yiyang to create a beautiful design and layout for the game that evolved as we progressed forward and ultimately decided on a final design during our beta stage. Sam is also helping me with the marketing and promotion aspect of triVios as his design role is currently not as demanding at this time. 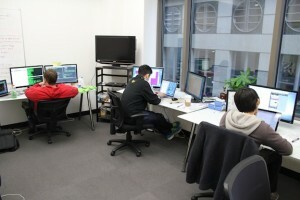 Josh worked in a hybrid role working on the front end with Yiyang and the backend with James. He also created some amazing database management tools from scratch to make my life much easier. Henry worked primarily on the front end with Yiyang and the triVios website. What were you doing prior to creating trivios? Andrew Nadhir: I graduated from Northwestern in 2010 with an economics degree but remained in school through 2011 to continue wrestling. I became an All-American my senior year, taking 6th in the country, and then had the opportunity to see different parts of the world for a couple months before starting a job as a proprietary trader. It was at this job that I met James Bell, our future CTO. After getting out of the trading industry, I searched for a different job in finance for a couple months, but in September 2013, I came up with the idea for triVios (there was no name for the game back then) and ran with it. James Bell: James graduated from Washington University with a degree in Electrical Engineering, spent some time in the Air Force, and then worked as a proprietary trader for a short period in Chicago. He was working on his own projects when I approached him and convinced him to join the Purple Gator team. Yiyang Yang: Yiyang was ruling China before coming to US in 2012 to get his Masters in Computer Science from Northwestern. When he wasn’t ruling in China, he was getting his degree in Electrical Engineering from Shanghai Jiao Tong University. 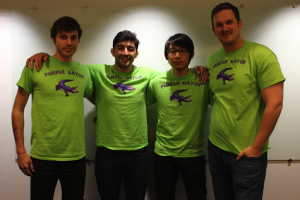 After finishing his Masters program, he joined Purple Gator. Sam Zoll: Sam graduated from University of Michigan in 2014 with a degree in Architecture. He moved back to Chicago after school and we were lucky enough to come across his resume. Although he didn’t have prior experience in UI/UX design, he was clearly the best man for the job. What other apps inspire you? A few apps I can’t live without are Google Maps, Spotify, and Flipboard. I’m good at directions, but I trust Google Maps way more than myself, not to mention it’d be that much harder to find restaurant phone numbers and order food. Spotify is just amazing. In the past, I would spend hours organizing my music and playlist (and I’m a bit OCD about that so it was miserable keeping everything in order). Now I just rely on Spotify to do all the hard work for me. I even pay the $10 for premium service. Flipboard is another one of my favorites because it makes it really easy for me to catch up on news I’ve missed in different categories. I love reading the technology section every night before I go to bed. Keeps me on the up in case I miss something important throughout the day. .
Head over to iTunes or Google Play to download triVios! Hey app devs! Wanna be featured like our friends at triVios? Click Here.